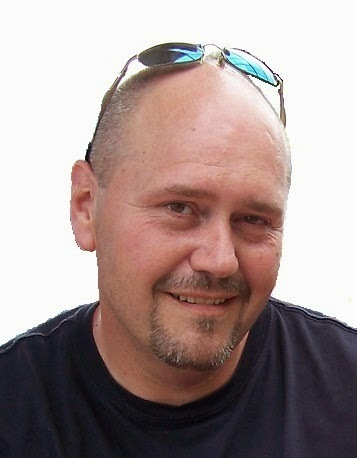 Please welcome John L. Campbell to The Qwillery. Omega Days (Omega Days 1) is out today from Berkley. Please join The Qwillery in wishing John a Happy Publication Day! John: Thanks for having me. I’ve been a storyteller as long as I can remember, and I recall scribbling little tales as early as six or seven. I suspect a certain female parent has them squirreled away somewhere. I got serious about writing in my early twenties, and jumped right into a horror novel. It was about as bad as a first novel gets, and still resides in a trunk in my study, far from the light of day. I caught the bug, however, and I’ve been writing ever since, though there have been long periods of inactivity. I’m in a prolific mode at the moment. As to the why, I don’t know that it was something about which I had much say. I have stories to tell, and I can’t explain the thrill I get from seeing someone enjoy my work. Two irresistible forces. John: With short fiction, I’m frequently a pantser, though I seem to be doing more and more research as I develop my craft. For novels, my plotting is more of a flexible framework. When I begin, I have a good idea of how the book will begin and end, I know who my characters are, and I’ve sketched out notes on scenes I want to see take place within the novel. And then I become a pantser as each chapter unfolds around a general idea or event, and this is where things can get so off-track that I have to delete multiple pages. But this is also where some of the magic happens as the story and characters take me in directions I didn’t anticipate. Instead of sticking to a rigid outline, I get so excited to see what happens that I chase after them. I’ll sit back after it’s written and say, “Wow, I didn’t see that coming.” I’ve had characters that started out as minor players destined to be eliminated early, but then they fight for their own survival and manage to hang on. One such character was supposed to die early in Omega Days. He’s survived into the third book of the series now. My challenge is what I (and my editor) call Crowd Control. I have a lot of stories to tell from many different perspectives, so my cast will grow wildly out of control if I’m not watchful. Even when I think I’m keeping them in check, my editor often has to come in with her scythe and mow some characters down so the story stays manageable. TQ: Describe Omega Days in 140 characters or less. John: Don't get bitten! Fast-paced and packed with zombie action, Book One of the Omega Days series lights off the apocalypse with a scream, and tears California to pieces! TQ: Omega Days deals with a zombie apocalypse caused by the Omega Virus. How did you decide to call the virus "Omega?" John: On the surface, the virus appears to be one hundred percent fatal, the last virus, the one that ends everything. And the story is all about the end; life and society as we know it, basic humanity as survivors descend to committing desperate acts and making cruel decisions, our loss of individuality amid the hordes of the dead. And the biblical reference is not an accident. Yet as dark as the story can be, I’m an optimist, and there is no ending without something new beginning. That’s where our characters come in, fighting to hold onto their humanity and each other. At its core, it’s a story of hope and redemption. TQ: Tell us something about Omega Days that is not in the book description. John: Some of my villains are more frightening than the living dead. A couple of my female characters are so strong, that many male readers have not only connected with them, but said they were their favorites. And there are zombies in the story. Not sure that was clear. TQ: What inspired you to write Omega Days? Why write about zombies? What do you think is the appeal of zombie fiction? John: I’ve always been fascinated by End-of-the-World stories, and I love zombies – they can be whatever you want them to be. For a storyteller, that makes for a dynamic source of opposition. I wanted to write a book where I could share my vision of a post-apocalyptic America, combined with a relentless foe. The appeal comes from the fact that zombie apocalypse stories ring a lot of bells with readers; technology has made us faceless figures in the mob, people are feeling overwhelmed by the seemingly insurmountable pressures of life, and there is an atmosphere of being powerless against uncontrollable forces; social, political, economic. They’re all parallels to the zombie tale, and it creates a connection. When the characters in the story begin to fight back against impossible odds, it resonates with people who are unable to do so in real life. And the apocalypse tale hits close to home. War, super plagues, economic collapse are all real possibilities, more so than, say, vampires. That fact gives readers a realistic opportunity to ask themselves, “What would I do if…?” It’s a powerful attraction, and one of the reasons for the popularity of the genre. To strip it down to the bone, there are some additional, very basic appeals; freedom from the routines of everyday life and an absence of authority. Finally there’s the chance to kill monsters without moral or social consequence. What could be better? TQ: What sort of research did you do for Omega Days? John: I dive deep on research, and a great deal of what I develop never makes it into the story. The details bring it all to life for me, though, and my hope is that if I’m comfortable with a subject, that will translate into smooth, believable writing. Examples? I researched principles and mechanics of helicopter flight, including specifics of the Black Hawk. I had to know California weather conditions in mid-August, as well as the water temperature of the San Francisco Bay. I poured over maps, studied San Quentin, learned the dates California college students moved into their dorms, did extensive research into military-grade firearms, and brushed up on some of my Catholic sacraments. I met with the U.S. Navy several times to talk aircraft carriers. They were incredibly helpful, though they politely told me there were certain things they could not discuss. Not a problem for a fiction writer. I make things up for a living. TQ: In Omega Days: Who was the easiest character to write and why? The hardest and why? John: Father Xavier Church was the easiest, and though many characters jockeyed for the pole position, Father X is my primary protagonist. I connect with him on several levels; his sense of responsibility to others and the burden that can often bring, his struggle with understanding his faith, his protective nature. There’s a lot of me in Xavier. The most difficult was Evan Tucker, my Harley-riding, wandering writer. It was his lifestyle, untethered and drifting, that made him a challenge. That’s never been my life. But it was also fun to try him on, and it stretched my writing to climb into the skin of someone so very different than myself. I am not saying I’m at home in the skin of my depraved villains, but they’re so much fun to write. I do good villains. TQ: Please give us one or two of your favorite lines from Omega Days. John: The thousand refugees didn’t show up until two days later. When they did, they were dull-eyed corpses rattling the fence. TQ: Omega Days was previously self-published. Have you changed the novel for this edition? John: It has changed. Once you begin working with a professional editor – and mine is awesome - there are certain to be changes, and I welcomed the input. There were places where I stood my ground, and others where I was flexible and ran with the suggestions. That relationship has been a great experience, and gets better with each book we edit together. The biggest changes were expanded content, and an extended ending. The original self-pub ended in a rather steep cliff-hanger…as in a vertical face. I took some heat for that from my readers, even many who loved the book. But hell, it was a self-pub in a crowded genre. I didn’t think anyone would even read it, much less have it become so popular. You can’t write with those expectations. The revised edition has more falling action and a bit more resolution, while still leaving questions to be answered in the sequel. It was a fairly simple process; I shuffled the first five or six chapters of book two into the end of Omega Days and turned that cliff-hanger into more of a steep slope. It’s a better novel now. 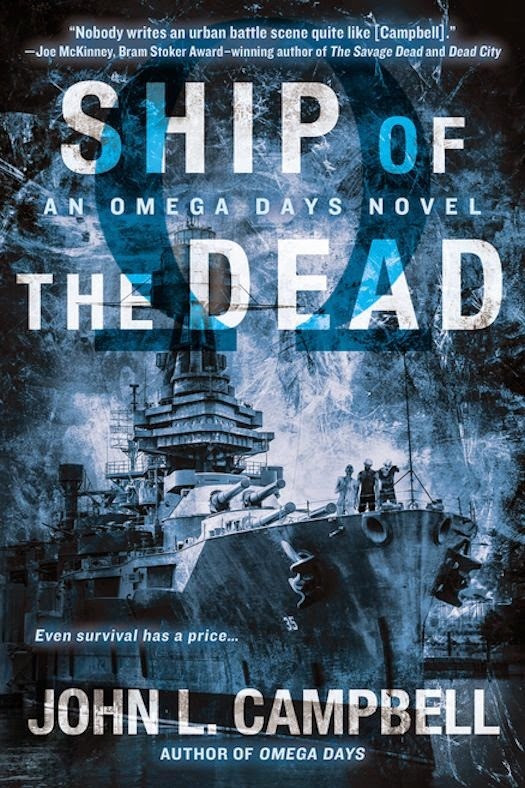 John: Ship of the Dead, book two, releases on October 7, 2014. The third book, Drifters, comes out in January of 2015. More will follow in the series. My editor is currently reading a stand-alone historical thriller I recently sent her, and I’m working on another stand-alone right now, a contemporary horror novel set in rural Ohio. I have multiple, additional projects working; two separate zombie novella series, one set during WWII, the other a bit in the future with some very unconventional dead things. I’m swapping ideas on a collaboration with an award-winning horror author, and there are another dozen horror novels knocking around in my head. I’m going to be busy well into my seventies. John: It’s been a real pleasure. 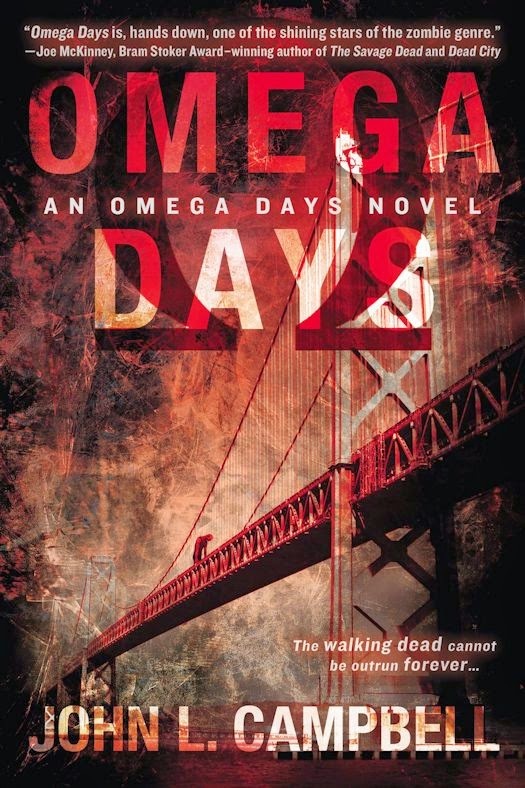 Omega Days is is set in California during a pandemic zombie outbreak and alternates between several main character's stories: Xavier Church, Skye Dennison, Peter Dunleavy, Angie West and Bud Franks, Bill "Carney" Carnes and TC Cochoran, Evan Tucker, and Vladimir Yurish. By limiting to the novel to one area of the world (though you know the outbreak is worldwide) and following the stories of several characters you get a close-up view of what is going on. It's easy to become emotionally invested in some of the characters, at least the ones that are not awful. The writing is straightforward and each chapter flows well. The alternating story lines shows how different people cope with what is happening and gives insight into each of them - all very different but each doing what they believe they must to survive. Some of these characters are worse than the zombies though and I must admit I'm hoping they reach a grisly end. There is gore but it is not over the top and serves to ratchet up the intensity of the novel. There are moments of heart-stopping action and heart-rending sadness. Campbell writes characters who are not perfect, make mistakes, and behave much like you would expect different types of people would act during the end of human civilization. The novel ends but does not have an ending (you don't know what happens to the characters) so I'm looking forward to the next book in the series, Ship of the Dead, to see who survives. Omega Days is a well-written character study of what happens when the world collapses, when zombies are roaming the streets and people have to rely on themselves or others to survive. Campbell gives us a front row seat to this truly horrifying scenario. John L. Campbell was born in Chicago, and attended college in North Carolina and New York. His jobs have included limousine driver, bouncer, store detective and investigator. Campbell studied Kendo, and is a professionally-trained interrogator. His short fiction has appeared in numerous anthologies, literary magazines and online ezines. Campbell's first book, RED CIRCUS: A DARK COLLECTION, assembled 21 tales of horror and suspense, and was followed by a second, larger collection of terror, IN THE FALLING LIGHT. Campbell's novella, THE MANGROVES, is based on actual events, and chronicles a WWII Japanese regiment which marched into the most horrific crocodile massacre in recorded history. Now, Campbell tears apart San Francisco in the apocalyptic first book of his new zombie series, OMEGA DAYS. Coming soon, the historical, horror/thriller, A JUDGE FROM SALEM, and the sequel to Omega Days, SHIP OF THE DEAD. Who and When: The contest is open to all humans on the planet earth with a US mailing address. Contest ends at 11:59PM US Eastern Time on May 14, 2014. Void where prohibited by law. No purchase necessary. You must be 18 years old or older to enter. This is my first introduction to this author, the characters sound really strong and I'm looking forward to a really well-told story. Thanks. This sounds very intriguing! I'm always looking for a new zombie book to glom :) Thanks for sharing!